It is the talented Charise’s turn this month in the Cocorico bee, and she has requested houses. She said that any house would be ok but that her favorites were Victorian and Edwardian. I found my inspiration in a book called The Queen Anne House: America’s Victorian Vernacular. 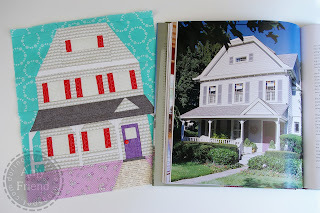 The book has a photograph of a house on Prospect Street in Madison, NJ. Honestly, I chose this house because it looked doable! A lot of the Victorian house are highly ornate and I didn’t want to bite off more than I could chew. But in addition to that, this house had a few interesting features that I that appealed to me. I liked the roof line. I thought it was unique. I also loved the fact that the house was shingled in what resulted in a scalloped effect (a perfect use for Grey Sundae from Ruby by Bonnie and Camille). I also love porches. So, this house seemed to be a good fit! 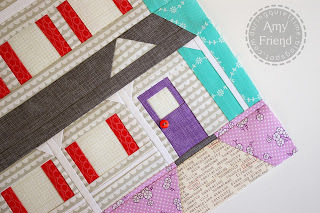 I copied the purple door as seen in the real house using Quilter’s Linen in Lavender but then added a touch more color for the shutters just for fun. They are Jewels in Pink from Outfoxed by Lizzy House. I used BasicGrey Origins for the window panes. I used a Sweet Broderie print by Rosalie Quinlan for the sky and an older 1930s repro print by Nancy Mahoney for P&B Textiles for the flower strewn front lawn. 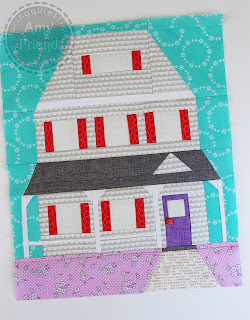 The front walk is Hometown News because I thought that the words were perfect for the theme of her quilt. I enjoyed making this block for you Charise, except when I realized at the very end that I had used the wrong fabric for one section and had to tear it all apart. After that, we needed some time apart so it went in the mail pronto. Cindy who said Awesome, Amy! I dearly love the pouch! I think I might do that with the petticoat linen I bought. :o) I haven’t cut into it yet as I’m waiting to find the perfect project for it. This just might be it! And thank you so much for the chance at an awesome giveaway! alidiza who said Your house is adorable!!! The petticoats is perfect for the roof and the green zipper just makes it! Congratulations everyone! I have already sent you email messages and as soon as I receive your addresses, I will put your thread in the mail. You will love it!